Dream Homes of Cabo is an expert general real estate broker specializing in luxurious beachfront and ocean view villas, condominiums, fractional ownerships, commercial sites, hotel resorts and new development opportunities in Cabo San Lucas, Los Cabos corridor and San Jose del Cabo, Mexico. The company offers full service real estate sales from general real estate, mortgage and financing, full legal and closing services with an on-staff Mexican real estate attorney. Dream Homes of Cabo real estate agency has partnerships and alliances with construction and building companies, architects, interior designers and furniture company located in our Cabo Dream Homes Design Center. This center offers our clients the opportunity to create their Cabo Dream Home from concept to reality. 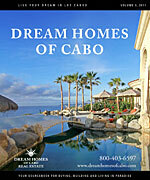 Dream Homes of Cabo team of experienced Realtors are knowledgeable about the numerous neighborhoods in the area. 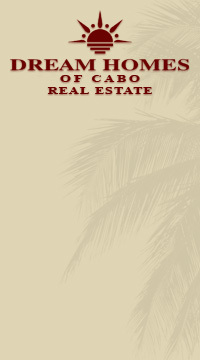 They can provide detailed information that will assist clients in their search for the perfect property in Los Cabos. Dream Homes of Cabo agents not only have expertise in fractional and full ownership, but they also have an intimate understanding of custom home building, as well as the various Codes, Covenants and Restrictions of Cabo area neighborhoods. If you are looking for a real estate property or a vacation rental in Mexico, the Los Cabos area is no doubt the most attractive region. Imagine yourself in a villa, condominium or resort right on or near the beach where the sun shines everyday and the sky is turquoise and cloudless; enjoying yourself golfing on one of the top signature golf courses in the world with breathtaking views of the Sea of Cortez or fishing while fighting the largest fish of your life in the "Marlin Capital of the world". As we know from our experience, many of our clients return back to Cabo and rent the same property, or decide to purchase their own dream home in Baja paradise. In Los Cabos there is an opportunity for everyone to buy, ranging from pre-construction condominium or villa projects, luxury resorts, land investments or development sites. Plese call us or e-mail us to schedule an appointment with one of our agents at: 800-403-6597. Dream Homes of Cabo hosted the Cabo Celebrity Invitational with Mexican golf legend Lorena Ochoa and 15 other sports and entertainment celebrities included among guests such as actor of the television series "24" Dennis Haysbert, former Minnesota governor Jesse Ventura, World Long Drive Record Holder Mike Dobbyn and retired NFL linebacker Bill Romanowski. The events were held April 26 through 28 of 2012 at the world-class Marina and Golf Resort, Puerto Los Cabos in San Jose del Cabo, Mexico. © 2002 - 2019 Dream Homes of Cabo Terms and conditions may be subject to change.